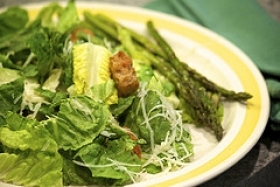 Have you made Asparagus Salad with Blue Cheese Dressing? 1. Bring water to the boil in the bottom of a steamer. Fit the baket into the steamer. 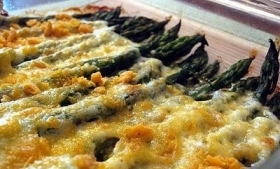 Steam the asparagus over medium high heat for about 6 minutes, until bright green and tender. Remove the steamer from the heat and let the asparagus cool. 2. 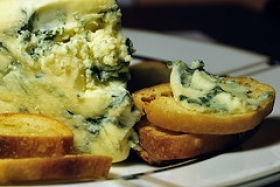 Combine the yogurt and blue cheese in a small saucepan. 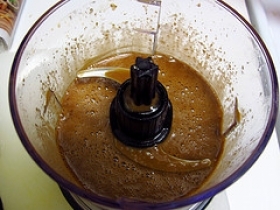 Warm over low heat for 1 to 2 minutes, whisking constantly, just until the blue cheese has melted. Remove the pan from the heat and whisk in the lemon juice, chives and garlic. 3. Arrange the asparagus in the centr of a serving plate and ring with the tomato wedges. 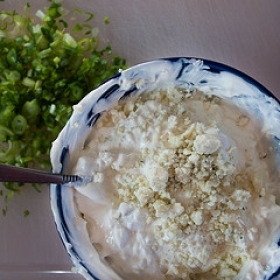 Drizzle the yogurt dressing over the asparagus. Sprinkle with the salt and pepper and garnish with the fennel. 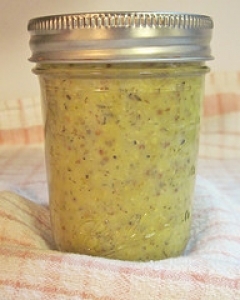 This recipe is a good source of Vitamin A with 12% of your daily recommended intake per serving. This recipe is high in Vitamin C with 39% of your daily recommended intake per serving. 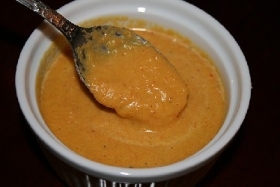 This recipe contains potential food allergens and will effect people with Wheat, Lemon, Yogurt, Gluten, Tomato, Cheese, Asparagus, Sulfites, Garlic, Fructose Malabsorption allergies.